Last week I had constant errors saying “CS Failed: [move_absolute] - :firmware_error”. 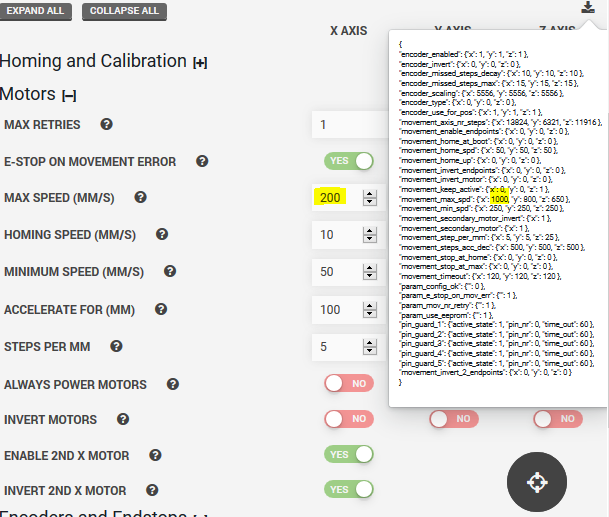 The reason was an update of the motor movement units from steps/s to mm/s. I noticed the variables changed but didn’t think of it to be more than a bug. Therefore I changed the settings back to what I had written down on my notepad. It took a while to figure out that there is a weird factor between the value displayed on the interface and the value manifested in the code (see yellow marked digits). There are probably more people who encountered this since its supposed to be used by kids too. Please make those kind of updates more visible and including older versions too, in case the software wasn’t updated for a while. A timeline styled blog in the webinterface would be nice. I ran into the same issue. However in general, new settings with mm/s are more user friendly i think. I am still not sure how this relates to microstepping though. I use microstepping on each axis currently.